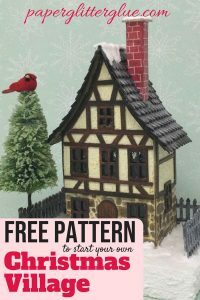 The Frosty Barn Christmas Putz house is perfect to make for your Christmas village. 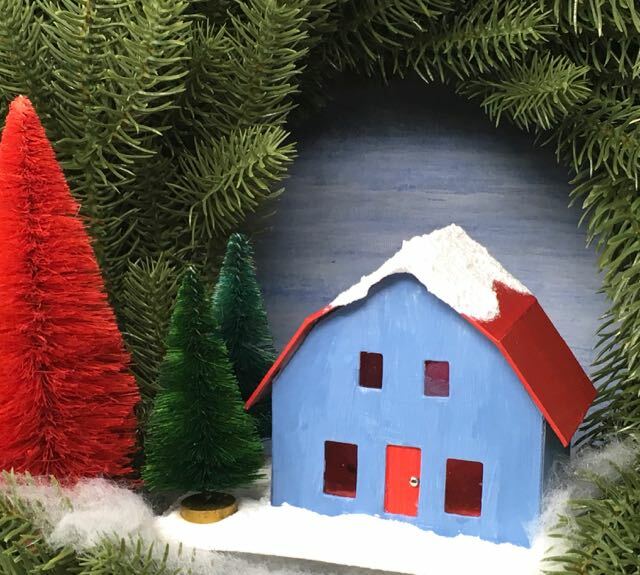 The Frosty Barn is a little cardboard house decorated with snow and glitter and bottle brush trees for the 12 Houses of Christmas challenge. 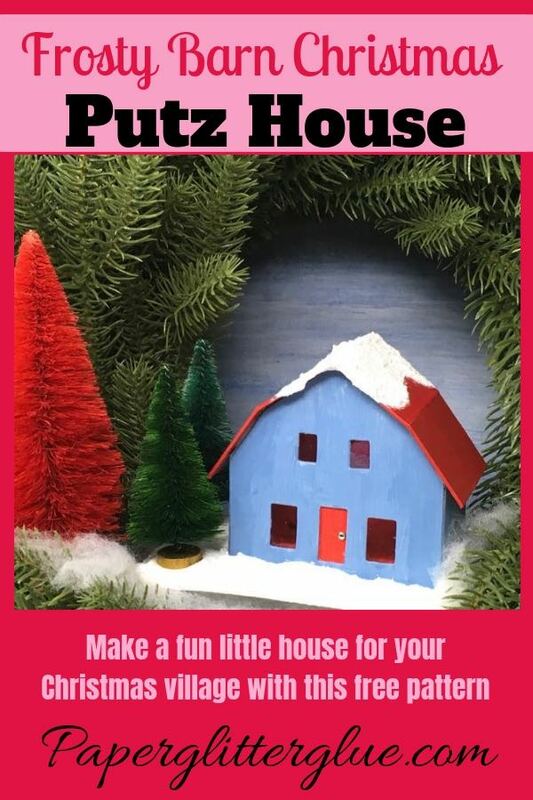 Vintage putz houses provided the inspiration for this little house. 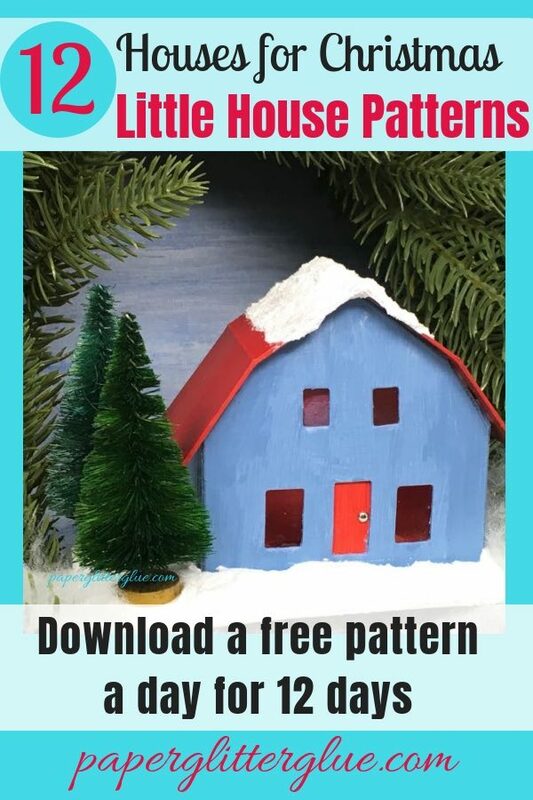 Surprisingly, the barn shape is a fairly common shape for a vintage glitter house. 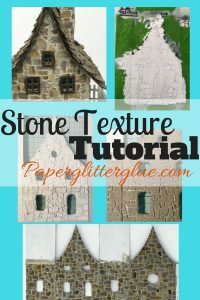 Download the free pattern from the Paper Glitter Glue Library. And how do you download the pattern? Well, it’s simple. Enter your name and email address below to immediately get the password and subscribe to the newsletter. 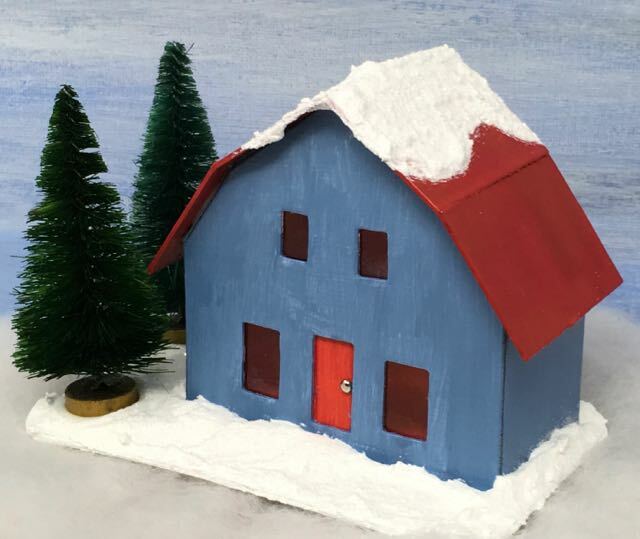 So how do we make the Frosty Barn Christmas Putz House No. 6? On the last house I plain forgot to take any photos of the process when I was making the house. I did much better with the Frosty Barn. 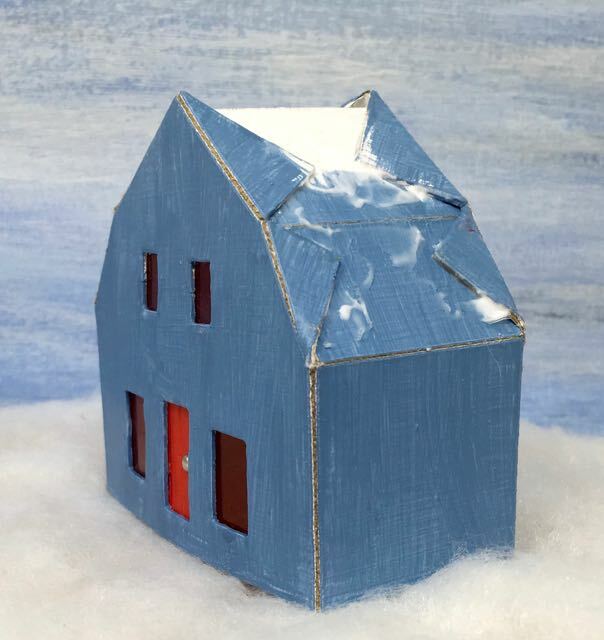 Here are more details on making the Frosty Barn Christmas house. 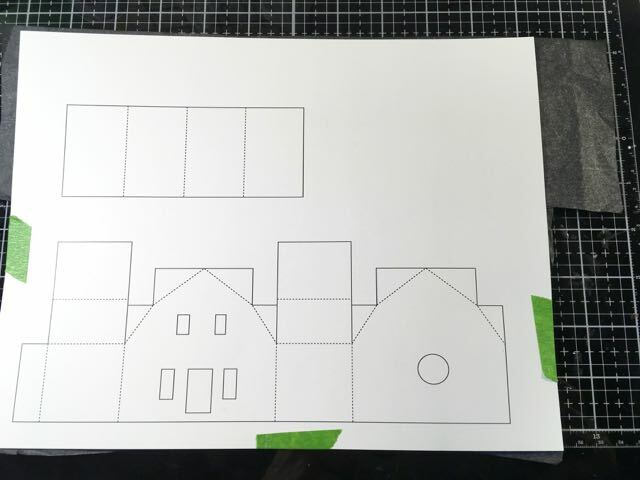 Here’s the pattern taped to the tracing paper and the cardboard. 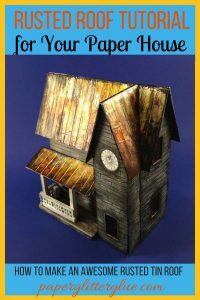 Tape the pattern to tracing paper and your cardboard. But do remember to have the tracing paper facing the cardboard. Usually I score the fold lines with the back of my craft knife because it makes such a nice sharp fold line. Then I cut out the pattern after I have scored the fold lines. Often it is easier to cut the little pieces first because then you have more to hold onto during the cutting process. 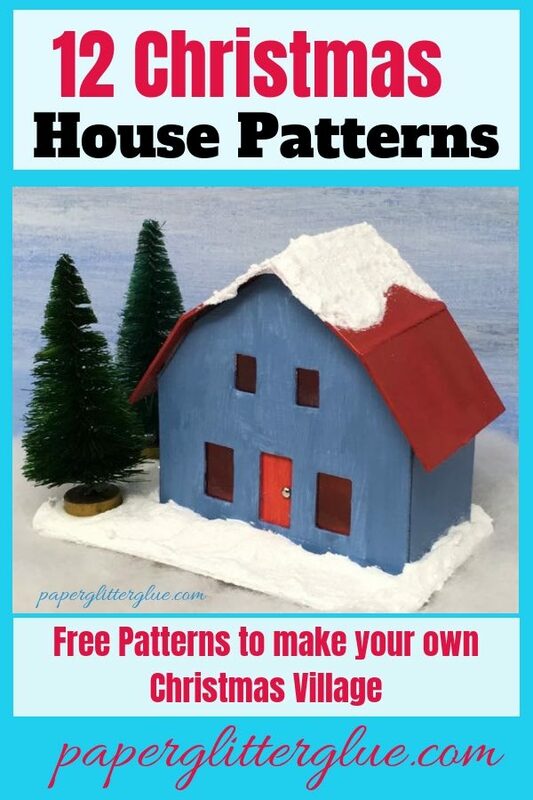 Please note that the pattern looks a little funny because of the barn-type roof. In order to make the roof flaps work they had to be longer than the top of the roof. For cutting out windows and doors I use these dies and an arbor press to make it easier. You can cut them by hand. 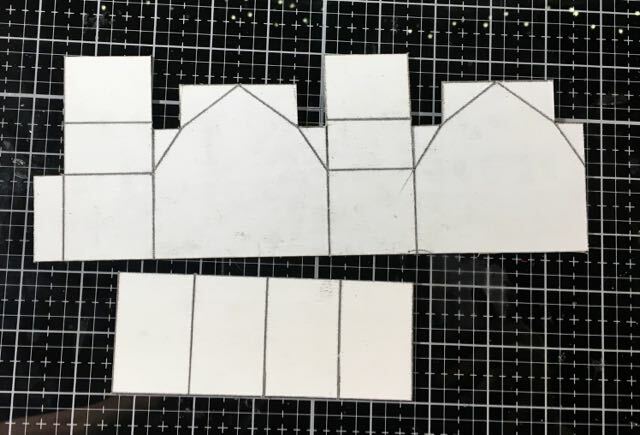 It’s just that I make a lot of houses so I use this shortcut outlined on this blog post for cutting out the doors and windows. Also if you cut by hand, you don’t have to put in as many windows. For example, you could move the door off center and have only one window on the lower level and one centered window above. Prime the barn with gesso because it makes the paint stick so much better. It also covers up the tracing paper lines. I prime and paint at this step because it is easier for me. But other people paint after the house already glued together. 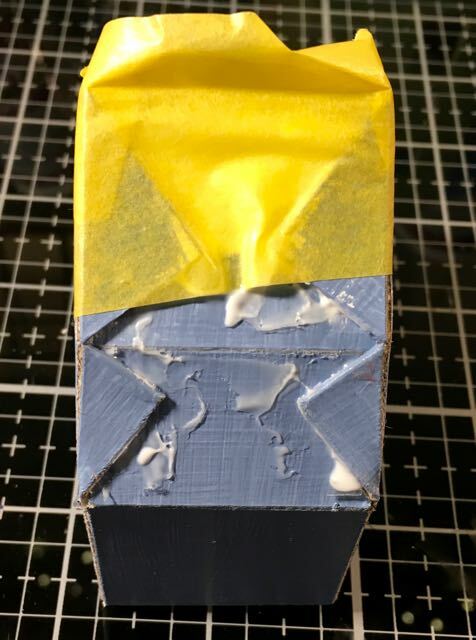 You can paint the corners better if you wait. What I do is touch up the corners after I have glued the house together, but before I glue the roof on. Now here is where I had a color decision to make. Before I put the house together I planned on having a green roof. But you can see from the photos that it didn’t work. So I repainted the roof (several times to cover up the green) to make it red. Much better. 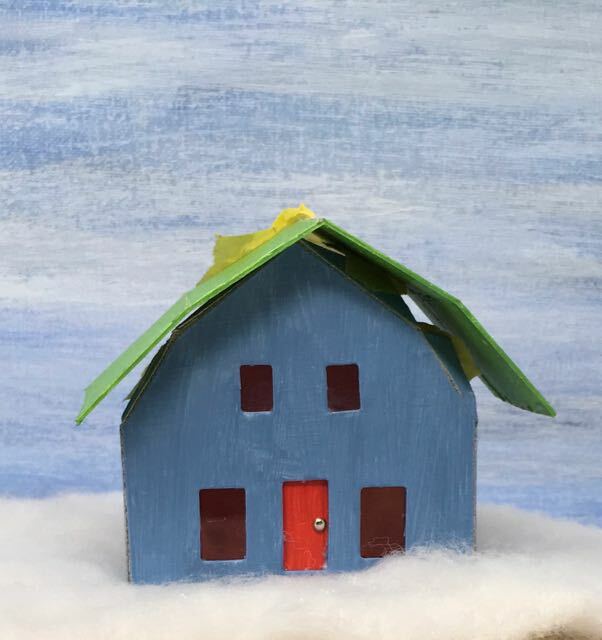 I put the green roof against the little barn and thought, “No way.” It just doesn’t work. Ah, red. So much better don’t you think? Here is the main reason I paint first before gluing the house together. I find it easier to glue on windows and the door before I’ve glued the house all together. I can place them better when the house is flat. So if I have done the painting before adding the windows and doors, I am less likely to get paint on them. Not only am I a messy painter, I am a messy gluer as well. In order to minimize glue balls everywhere I try to glue these on when the house is flat. There is always one step that is a little challenging. This is it. To glue the house together I use a number of techniques – painter’s tape and binder clips most often. But sometimes there is no substitution for holding a piece in place by hand to make sure it is situated properly. 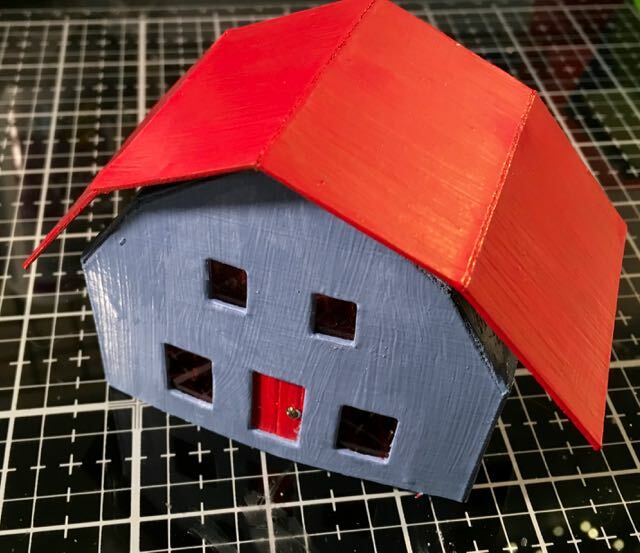 On this little barn I had a heck of time trying to get the roof glue tabs to stick. You can see by how much tape I had to use to get them to adhere. And that was with my manually holding them down as well. It worked but it too some time. I used tape and my fingers to get the little roof tabs to lay down flat. For you, the best way to do it is to glue one side at a time. That will be much easier. So remember glue one side of the roof at a time. After wrestling with the roof tabs, this step was a breeze. The photos shows you how nicely the roof stuck to roof flaps and roof tabs. See how nicely the red roof stuck to the house? Now glue the barn to its cardboard base. I just run a thick bead of glue along the bottom of the barn and firmly place it on the base. Wiggle the house a little bit to situate it well on its base and then hold. Usually after a minute or two of holding, gravity is enough to get the barn to stick. How to decorate the barn? 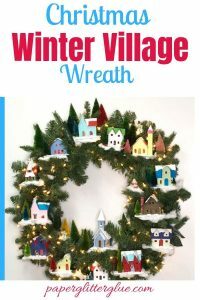 Here’s the fun part for most people – decorating their creation. There are no rules for this step. 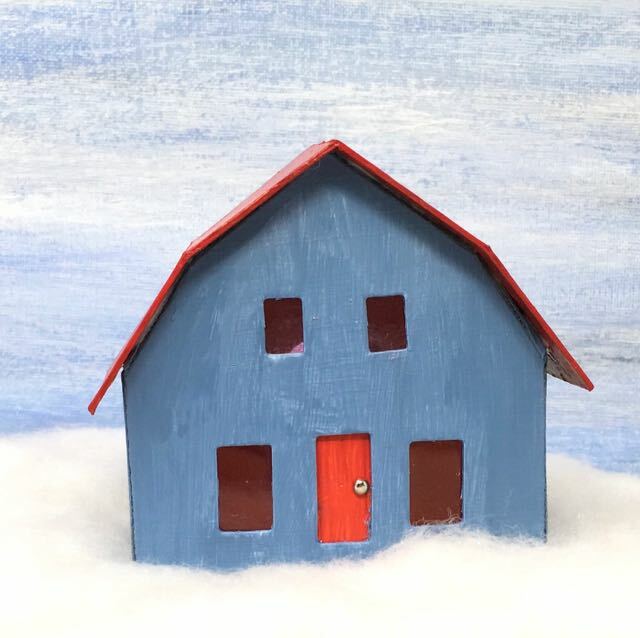 Just use your imagination and make your little barn reflect what you love. 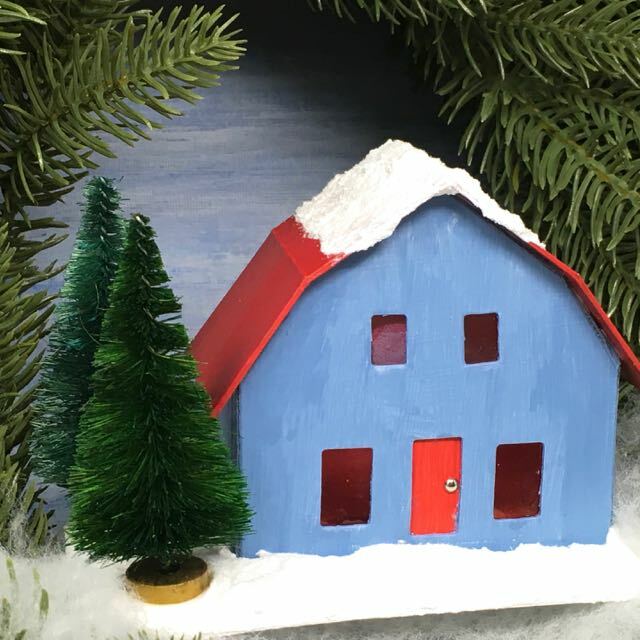 Truthfully, I haven’t been too creative in the decoration department because I am making a Putz house a day, but you can go wild with whatever you think needs to be on your house or your barn. Maybe a glittered cow? Or a miniature horse figure. Tiny ducks? Birds in the trees? More snow and glitter? Just add what delights you. Well, that’s it for today – I hope you will try the Frosty Barn. Tomorrow we’re making a very interesting house with a Bow-shaped front. See you then. P.S. If you have any questions you can leave a comment or email me at Lucy@paperglitterglue.com. I will be glad to help. And feel free to pin to your favorite Christmas board.